This vibrant blue saddle pad is the perfect pop of color you need in your tack collection! This pad features a shock absorbing felt material, leather trim for maximum durability, and a wither cut out to alleviate pressure points. Only $79.99 today! Was $139.99 NOW $79.99 For A Limited Time Only - Black Friday/Cyber Monday Savings! 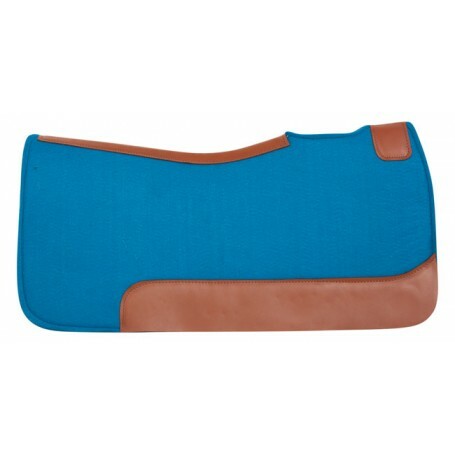 This vibrant blue felt saddle pad is the perfect pop of color to add to your tack collection! 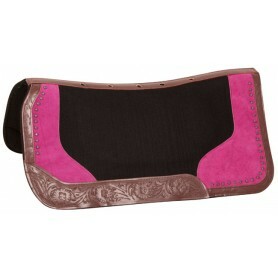 This pad reduces the risk of galling or rubbing while keeping the saddle in place. The therapeutic qualities in this felt pad will conform to your horse's back for optimum comfort within the first ride and helps to alleviate any pressure points. The shock-absorbing felt wicks away moisture to keep your horse cool and comfortable throughout the ride. The two piece construction with a spine channel aids in cooling. This pad also features a top-grain brown leather wears along the spine for maximum durability.